1) MRR With E-book including Ebook, Graphics, Squeeze Page. Basic: You're allowed to select 5 from the list. Delivery: Max is 2 days, but usually within 24hrs unless network problems. why you sell so cheap? This because I like to help shoestrings budget marketers. can I buy on your website? no, this is ONLY on SEOclerks. do you add more to the list in the coming future? yes, I will update once a new product is ready. do you have PLR products? 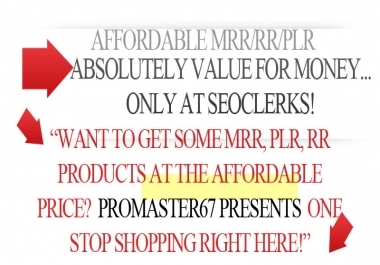 yes, I will make another service for PLR products. do you have MRR with videos packaged? yes, I will make another bundling service for MRR video products. The Master Resell Rights package allows selling to your customers both the product and the resell rights to that product. In other words, if you buy a product with Master Resale Rights, you can resell it and (if you want) you can pass along the resell rights to your customers too. This increases the value of the product significantly, because your customer may resell the product for profit as you did. In my research for this rights package, I did not see that it allows you to change the product in any way although that may be covered in the package terms that you should have got with the purchase. Visit here to view the current time in the Kuala Lumpur and see if I am available for these hours. Orders will not be processed and inbox messages will not be replied to outside these hours which can be viewed by checking here If you have a question please INBOX me first.